Always Write: Meet "Mr. Stick"--our classroom's "Margin Mascot"
In my experience, students need to like and care about their writer's notebooks. Mr. Stick's presence helps my students enjoy looking back through their notebook for ideas for upcoming writer's workshops! He is our classroom's "margin mascot." Download at Teachers Pay Teachers for Free! Mr. Stick is our "Margin Mascot..." He gives us permission to draw alongside our practice writing and be visual using fairly primitive skills. Here's a list of things I personally can't do well that I wish I could do well: 1) sing, 2) dance, and 3) draw. I still do sing, dance, and draw regularly in front of my students, however; I refuse to allow my lack of skill to squelch my attempts to do these three things that I enjoy...but lack the talent to do well. My singing and dancing, by the way, both embarrasses and inspires my students. My goal with my students is to make them like writing...even if they don't see themselves as skilled writers. When I ask my students to list three things they don't do well in school, writing often makes their top three. I truly believe you will never become better at something unless you do a lot of it, and that means practice, and if you're against practice or cannot find a way to make practice fun, you should probably quit the team or the instrument that someone's forcing you to master. I don't expect my students to master writing. I expect them to improve in small increments with every assignment, and that means my writing strategies and mini-lessons better make the act of practicing writing fun. Mr. Stick is often our element of fun. My kids howl with delight when we share our "Mr. Stick writes" with each other. Pre-writing and practice writing are both such an absolutely critical part of the writing process. I've come to believe that most of us do a fair-but-nowhere-thorough-enough job helping students understand not only that they're important, but also that there's a variety of "shapes" pre-writing and practice writing can take. In our classrooms, most of us teach processes like clustering, outlining, and/or free-writing, but these are actually "tip of the pre-writing iceberg" skills. Donald Graves--the great author/writing teacher--once suggested that, when the writing process is truly being honored, a student could very easily spend 85% of his/her time in the pre-writing stage alone. I always marvel at that lofty number when thinking about my own classroom's writer's workshop. I honestly don't believe I've ever come close to spending 85% of our instructional time in pre-writing with any of my best writing lessons, but I like keeping that number in mind when I challenge myself to do a better job with the work we do before composing actually begins. I'm forever seeking new ways to pre-write and practice write. I have become so very devoted to writer's notebooks as the foundational tool for our writer's workshop because they offer that daily opportunity for my students to simply explore ideas and thoughts and words without worrying about structure or conventions. Weekly or several times weekly, I expect my students to talk to each other about the practice writing that finds its way into their notebooks. Simply talking about what one might write about is a huge part of pre-writing; when students hear their own ideas out loud from their own lips, and when they hear one another's ideas during "notebook sharing," I see great ideas spark in their eyes during the exchanges. You really can't teach students to talk about potential writing in a meaningful way, but you can model it using your own writer's notebook stories (I'm assuming I might have convinced you to start keeping one! ), and you can faithfully provide them class time to simply share their best ideas out loud with each other. Once or twice a week, we get five simple minutes to share with our established sacred writing time partners. Talking about one's practice or pre-writing is one simple way to move closer to that 85% that Donald Graves hinted about and--unintentionally--gave me a personal classroom goal. But how do you deal with that natural shyness almost every student shows when asked to share his/her ideas for writing with a peer--even a peer they have chosen as a sacred writing time partner? How do you move a student from believing that one of his own ideas is "stupid" to thinking that there may be a potentially larger piece of writing that could grow out of his practice writing? I do have an answer to both those questions, and at first glance, it may seem ridiculous. But Mr. Stick works. He absolutely works, and he has since I introduced him in 1996 to my students. Mr. Stick began his work in my classroom as--literally-- our "margin mascot." After doing some reflective writing in our journals back then (this was before I transitioned to writer's notebooks), I asked my students do create a quick stickman drawing in the margin near something they wrote that stood out as worthy of future discussion. I required them to add both a facial expression and a dialogue bubble that worked together to convey an additional idea to something they'd written. Mr. Stick would say things like "This is probably debatable," "This reminds me of [topic]," or "Could I sound more annoyed here?" When I'd ask them to share their reflective ideas with each other, the conversations almost always began with a Mr. Stick comment they'd written; it naturally drew them into a conversation about what they'd written rather than read their entire reflection verbatim to each other, which is what they had done before Mr. Stick. Instead of haphazardly listening to each other, the Mr. Stick in the margin got them really talking about their ideas, and because so many of us were bad at drawing him, the conversations were filled with laughter. If one particular group was "howling" with delight over someone's bad drawing, suddenly everyone wanted to know what sparked that conversation. Our journals were being passed back and forth like crazy, and my students began trying to out-stick each other. Our use of the classroom stickman has evolved over the years. My non-artists--thanks to stickman practice--get much better at adding visuals that help their writing be more interesting to hear about. My artists go out of their way to make their Mr. Sticks be pretty amazing. Our original margin mascot regularly pops up in vocabulary and homework assignments that were never intended for the journal or the writer's notebook. He creeps his way into my colleagues' interactive notebook assignments. His most important element remains exactly the same: he invites you into a conversation. When I ask my students to discuss ideas with each other that they've written and sketched about, the Mr. Stick art always begins their conversations. My students don't sit their quietly when it's group discussion time, and they don't start by saying, "This is probably stupid but..." Instead, they actively listen to one another's explanations of what their visuals mean, and once that's out of the way, their discussion go deeper and deeper. My first Mr. Stick Notebook model: In the very beginning, I taught my students to do the drawing and discussing. I then watched them interact with each other and spied and monitored. I was a distant observer of their learning. That all changed when I took one summer to create my very first, Mr. Stick-inspired journal over the summer of 1998. When I became a sharer of a notebook in my own classroom, my role changed, and I was seen as a fellow participant in the thinking and writing process. Up until then, I had been the traditional "listen-to-me-talk-for-a-while and now-it's-time-for-you-to-talk-or-quietly-reflect" kind of teacher. Teaching was something I did to them, not with them. Twenty years later, my teaching style actively and purposely includes me in their process, and I can trace back that dramatic paradigm shift to my "Mr. Stick Goes to Washington" journal. Having my first authentic teacher-model of a journal made a huge impact--on both them and on me. And on Mr. Stick. My journal did very cool things with Mr. Stick that my students began emulating. It all came about this way: September of 1998, that was when I first premiered my elaborate, Mr. Stick-friendly journal, which I I had created that summer. You see, I had won an educational fellowship from the C-SPAN cable network (thanks to some of my students' hard work and a contest we'd entered the year before), and for a month that summer, I worked in Washington, D.C., helping C-SPAN develop some online educational resources. It was an amazing summer to be in D.C., especially to someone who had never been there before. When they handed me an empty composition book on my first Monday there and said, "You have to keep a journal that documents your work," I asked, "Can I include visuals too? I'm not a very good artist, but I'd like to try something unique with this journal." Wonderful things happened all around me while I was in this new-to-me location, and it was a perfect circumstance for maintaining a new journal. That was the summer of Monica Lewinsky, and I was a mere two blocks from the Capitol building when two Capitol security guards were shot and killed in a tragic attempt to attack one of the nation's Representatives. The picture (above--click on it or here to see it larger) comes from my journal, and the Mr. Stick sketch here has me and a fellow fellowship-winner, Bob, watching C-SPAN's coverage from that tragedy the next morning in the control room. I learned so much about skillful editing that day while I listened to the TV segment's director selecting from a variety of potential visuals as people expressed their emotions on a call-in program. For the first time ever, I had a complete journal that I could show as my teacher model; it was the exact kind of journal I wished I had been given permission to create when my teachers required journal-keeping from me. My new journal's presence gave my students the permission I had never been given. That was the year I began seeing the best journals I had ever had from my own students...or from any other teacher's students. That winter, I was also teaching inservice workshops after school to my fellow teachers, and when I asked certain students if I might borrow their journals (we weren't calling them "writer's notebooks" back then...not yet) to show during one of my evening classes, they looked petrified that I might lose them if I took them out of the classroom to show others. Know this, I never did lose a single kid's journal, but I also never had students so dedicated to the journals they were keeping. and the pre-writing they were capturing on the pages. In just a few short years, with just a few strategies in place, my students' reflective journals went from half-hearted attempts at pre-writing to treasured tools that proved they were thinking about important ideas. It was that simple little stickman. He made reflection time and sharing time interactive and fun. Anyone could draw him. Everyone did. He helped us talk about our ideas for writing for our upcoming writer's workshops. In my classroom today, with my fancy Interactive Smartboard and our wheeled cart of wireless laptops, we truly have an authentic writing environment that cost my district a pretty penny. My digital camera, which allows me to take detailed photos of my students' work (so I don't have to ask to borrow their journals anymore!) was also quite an expensive investment. I still marvel at how Mr. Stick--the simplest, cheapest technique ever to enter my classroom door--has made the biggest difference on my students as writers and thinkers. On my last day interning at C-SPAN that summer, the education staff asked if they could make a copy of my C-SPAN journal. I watched them carefully copy each page on the Xerox machine, laughing and pointing out things I had written about my time there. Members of other departments stopped by to see what the commotion was, and at one point, there were a dozen people reading my journal pages as they came off the duplicating machine. If I had written just block paragraphs, none of that would have happened; Mr. Stick invited those wonderful people into my thoughts and reflections. He'll do the same thing in your classroom...if you let him. I happily give away so many ideas from my classroom at this little old website of mine. I hope you will always remember to give me credit for any idea you find here, adapt, and share with others, including with your students and their parents. I'm going to be a little blunt here, but I become a bit sad for our profession when I discover a teacher who is not only using my freely-posted resources, but who has also actually placed his/her name over my name on documents from my website, as if claiming the idea was originally their own. This has happened to me dozens of times since I began sharing my ideas on this website and on WritingFix. Me? I try to always give credit where credit is due. I hope you do too. That's the act of a responsible educator. That said, I must not claim that "Mr. Stick" was my own creation. Like I could really invent a stick-man, right? Allow me to direct credit where credit is duly due. Back in the mid-1990's, when Star Trek: The Next Generation was still running brand new episodes, MTV had a thirty-minute cartoon program called Liquid Television. Liquid Television was always on a half-hour before they aired the latest Star Trek: TNG episode. If I recall, this all happened on Wednesday evening, and I, therefore, had a Wednesday ritual that was rarely missed. On Liquid Television, they had many regular features, but one of my favorites was called "Stick Figure Theater." Each cartoon took a soundtrack (dialogue and music) from a classic movie (like It's a Wonderful Life), and they re-told the story with animated stick-people. These stick people had shoulders and knees, they had two-jointed arms and legs, they had simple but effective hands, and they had these facial expressions that were hysterical. I loved their faces the most; the stick-interpretation of Jimmy Stewart needs to have great expressions, and believe me, he did. Here is a You-Tube link to that I hope you are able to access to see what I mean. I was teaching high school back in those days, and I had a cool, semester-long elective class that focused exclusively on poetry. I decided that year, we would read a poetry-filled Shakespearean play not normally studied at my high school: King Lear. After each act, my student poets had a choice to either summarize the act with a one-page write-up, or they could story board the act if they felt artistically motivated. Had I been one of my own students, I would have always chosen the summary writing over the art option; my older brother was a skilled artist, and his drawings always intimidated me to try drawing. For the third act of King Lear, one of my favorite students of all time--Stephanie Perry (if you're reading this, Stephanie, contact me; I've been dying to know what you're doing now)--surprised me by creating a story board (shown above--click on it to see her amazing details!) that clearly showed she too was a fan of "Stick Figure Theater." I was so inspired by the quality and simplicity of Stephanie's Act III story board, that I forced myself to learn to draw stickmen in Liquid Television's style as well. The next year, I started teaching all my students to draw "Mr. Stick" in their notebooks. I had begun my own Master's Program by then, and I was actually using Mr. Stick in my own night classes when I took my notes during lectures; the students loved to see my doodles alongside the notes from my own night-class, and it inspired them to "outshine" me with one of their doodles from my class. Over twenty years later, Mr. Stick is still a beloved character in my classroom. My middle school-ers are starting to do very creative things with him, as you will see lower on this page. They always say, "But you draw such better Stickmen than I do, Mr. H.," to which I always respond, "I just practice a lot. Keep practicing. You'll be amazed what artistic skills are hiding in you." I used to beg my students to borrow their notebooks and journals when I was doing an inservice presentation in my district or out of state. Now, they freely submit their best work to me to photograph every Friday, and I post it to my Pinterest boards. I no longer have a shortage of great student examples, and my students absolutely glow knowing that other teachers across the state, nation, and globe are re-pinning and showing off their work in classrooms. Please don't be shy in showing them any of the student samples below. In 2008, I completely changed my philosophy on extra credit. Instead of offering to students (who had frankly slacked off) extra things to scramble and do at the end of the semester or school year, I let them know right up front that there would be only two ways to earn extra credit from me, and those options will disappear during the last month of every semester. For every one of my classes, I offer a weekly "contest" in two areas: 1) best Mr. Stick-inspired writer's notebook page of the week; and 2) best Vocabulary Collector of the week. The daily writing in our notebooks and weekly collecting of vocabulary words are already embedded into my routines, so these are not extra tasks for my students to complete. What my two contests ask of students is that they strategically put some extra effort into what I am already requiring them to do on occasion so they can self-nominate themselves for extra credit during a week they have some time to put extra effort into their assignments. As a result, those who deserve it "bank" extra credit points early on by participating, I end up with amazing samples to show their predecessors, and students who don't believe in putting in extra effort take themselves out of the "Is there anything I can do for extra credit?" conversation. Every day, my students write in their writer's notebooks during Sacred Writing Time. They write for ten minutes and have the option to go back and decorate their words afterwards. This is a routine, and that is my one rule about the routine. There are some days when what a student writes during those ten minutes strikes him/her as being more interesting than what he/she wrote on other days. Perhaps that student saw a fun topic to respond to on my SWT slide that day. Perhaps that student saw something on the way to class that just needed to be written about, and then did a good job doing with that writing. Perhaps that student tried out a clever approach that had not been tried before. When those days of writing happen, I encourage them to "Go home and decorate it. On Friday, you can nominate yourself for a 'Mr. Stick Notebook Page of the Week' award." Each Friday, I have a special crate for these self-nominations. Students mark their nominated page with a sticky note so I can find it immediately. They are allowed to nominate the same page up to three times in case they enter during a particularly competitive week. Winners are announced Monday, which is when they receive their extra credit points (as well as an extra credit prize from my Dollar Store basket of goodies), though most of my students know they're winners before entering class because they check my Pinterest boards regularly. I used to try and do an extra credit prize for every class every week (I have six different classes), but now I select just two or three winners per week from the whole bundle of entries. There are weeks where I only get one entry, and that person earns "easy extra credit," which prompts two dozen students to try the next week. My students' writer's notebooks become great because they inspire each other with ideas and with attempts to put forth quality work on occasion. Having this permanent set of great student models of great writer's notebook pages has done nothing but further improve the quality of what I receive from my students each week. 7th grader Andrea recounts a day at the water park. 7th grader Victoria explains her love of narwhals. 6th grader Josh gives voice to four superheroes. Click on images to enlarge and view them at Pinterest. Re-pin them to be able to show your own students your favorite examples. 6th grader Chaz tries out Talk Like a Pirate Day. 8th grader Austin ponders sunsets on Mars. 6th grader Dylan endures one scary waterside. 7th grader Hannah retells a story from mythology. 8th grader Emily writes a free-verse poem. 7th grader Savannah shares how to wash a dog. 7th grader Morgan turns me into a Ninja. 8th grader Patrick creates an original character. 6th grader Susie is disgusted by hallway kissing. 7th grader Yajaira creates an original horror story. 7th grader Kasey pens rhymes about my class rules. 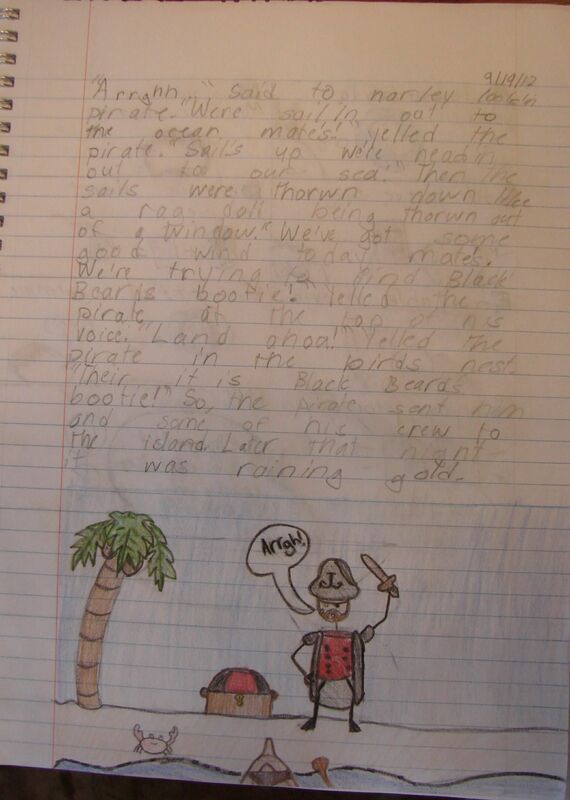 6th grader Ethan's two-page safari story. View dozens and dozens more winners of the Mr. Stick of the Week award at this Pinterest Board. Mr. Stick Takes over our Vocabulary Routine Too! I love my weekly vocabulary routine. Every Friday, my students must "publish" four short pieces of original writing, each inspired by a tier-2 vocabulary word we found in our reading for the week. Every other Friday, when my students have 8 "published" words in their possession, we spend the period teaching one another our vocabulary words and celebrating one another's attempts to write with them. There are ten different writing activities that students can choose from when completing their four pieces of writing about vocabulary each week. In a given week, they may not repeat any of the four writing activities when choosing from the ten options. One of the most popular options has become the "Mr. Stick Vocabulary Cartoon." When using this option, students must explore a new context using a vocabulary word, and they must capture that context using Mr. Stick as their cartoon's star. Rebekkah's cartoon (6th) teaches decree & gilded. Tayler's cartoon (7th) examines peroration. Emilee's cartoon (8th) conveys plight. Irene's cartoon (7th) teaches compulsive. Jaysen's cartoon (7th) demonstrates lethargy. Chris's cartoon (7th) models almsgiver. 8th grader Serene explores motley abstractly. 7th grader Tia personifies incandescent. 6th grader Aiden has a Mr. Stick hidden in his layout. View more of my students' vocabulary work at this Pinterest Board. So students can earn extra credit from me during weeks 1 - 15 of the semester by winning my weekly "Mr. Stick of the Week" notebook competition. I don't give extra credit options during the last three weeks of the semester...or do I? If a student has won a "Mr. Stick of the Week" award in my classroom, he/she is eligible to enter my "Mr. Stick of the Year" competition, which is the only way to earn any extra credit during the last three weeks before report cards. During those final three weeks, those eligible to enter may spend all of their sacred writing time planning that page (or two) that will simply blow my mind and go down in the annals of Harrison history. Or at least be posted at this special Pinterest Board. Those not eligible to enter my end-of-grading-period extra credit often grumble, "Well, if I'd known you were having this contest, I would have tried to win one of the weekly awards." I respond with, "Oh, so you would have put extra effort into your work if you'd known? I guess that's why your classmates were putting extra effort into their work throughout the school year, not just here at the end of it." I then I smile to myself. The Mr. Stick of the Year winners are what I show my incoming students after they have their writer's notebook routine down about a month into every new school year. They inspire my students to try to win one of the weekly awards just so they have the option to enter this one. Here are some of the great entries I have received over the years, and I encourage you to set up a similar contest; I have never been prouder of notebook writing that my students capture with entries like these. Mimi's topic--5 unmarketable Barbie Dolls--blew everyone's mind. A year later, she created this sequel, but this original entry is one of my favorites. The Mr. Stick in the bottom right-hand corner is almost missed, but Hannah's discussion of his importance to her notebook in the poem can't be missed. Our 8th grade San Francisco trip makes for great writer's notebook pages, but Sarah's colorful entry here serves as a memory for herself and her friends. San Francisco makes an appearance in this entry from Jacie, but I like that she's got me "sticked" so nicely near the Capitol building. Cyrus and I had (and still have) similar taste in video games, and his BioStick (instead of Bioshock) was a parody we both could relate to. I still bump into Cyrus at his high school, and our conversations start with "What level you on?" My ego admittedly likes it when my students write about moi, as Savannah did, but she accurately captured the year when I had to verbally put many of her classmates in their places because they were particularly rowdy that year. Jackie put a lot of time into this two-page spread about a unique climb up a hill to ponder her place in this vast universe. Her stickman captures that nicely. When I display Dylan's Stickman-themed board game at the beginning of the new school year, I inevitably start getting a new board game or two every month. Chris "sticked" himself for the contest, and when I show that to my students, I start getting great stick versions of themselves and their friends. Nico "sticked" the "Duck of Death," which was the nickname we gave the quacking my phone emitted as the signal that SWT time had ended for the day. Alejandra (Alex) "sticked" her favorite memories of eighth grade, and I love how she punctuated the memories with her versions of the Mr. Stick emotional faces. This is one page from Ryan's two-page spread about our 8th grade trip to San Francisco. It's nice to have a documentation of each year of that annual trip. At the University of Nevada-Reno, I proudly served as Co-Director and Director of the Northern Nevada Writing Project between 2002 and 2008. I say it a lot, and I often say it loudly, but I'll reiterate it once more here: our NNWP provided me with the finest professional development experience of my teaching career; I became Director afterwards because I wanted to give back to this fabulous organization that truly changes so many teachers' practices. During their five-credit summer institute, which I took way back in 1996 as the very first class in my Master's Degree program, I learned the strategies that helped me truly believe I could be a writing teacher, and I left that institute with the motivation I need to change my classroom into an environment that--first and foremost--developed critical thinkers who show what they know through writing. As part of any Writing Project Summer Institute, each participant develops and presents a 90-minute, research-fueled demonstration lesson focused on a specific "best practice" related to the teaching of writing; if a demonstration lesson was good enough, the NNWP would hire you to present it at future professional development opportunities in the area. The demonstration lesson I created during my institute focused on using word processing to make the writing process feel more authentic to students, which was still a fairly new idea back in 1996; sadly, I was never hired to present that particular demonstration lesson again, but that's okay. Two years later, however, my experiences with Mr. Stick and engaging my students with their reflective journals had given me enough new materials to create an even better demonstration lesson for the NNWP. Over the ten years that followed, I presented my Mr. Stick materials close to a hundred times; it was such a popular session wherever I went, and teaching colleagues began calling me "Mr. Stick," which I kind of thought was charming. Kind of charming. In the good old days before the NNWP lost its federal grant here in Nevada, our NNWP created local teacher leaders by helping them develop the skills to effectively present demonstration lessons to each other; I was not a teacher leader until they brought me into their organization. Over the years I worked with them, I created and developed dozens of demonstration lessons for them, and doing so has made me such a better writing teacher; when you learn something well enough to teach it to another teacher, you have truly learned it at a very high cognitive level. I have created dozens of other demonstration lessons for the NNWP since introducing Mr. Stick, but the Mr. Stick materials will always hold a special place in my heart. They gave me my first experience with success as a professional development provider, which motivated me to become an even better teacher leader. My Mr. Stick demonstration lesson was called "The Cave-Wall Journal" because I always felt the journal drawings were similar to primitive petroglyphs; you can see my Mr. Stick cavemen on the cover of my demonstration lesson's packet (above). My presentation taught my participants how to draw Mr. Stick, how to give him a face and a voice, and how to design reflective journal assignments that were "Mr. Stick-friendly." During my 90 minutes, we analyzed many student samples of both journal pages and the portfolio pieces they inspired, and I finished my demo by challenging teachers to create their own "Mr. Stick journals," like the one I had that documented on my trip to Washington, D.C. In 2008, after ten years, I officially retired my original "Cave Wall Journal" presentation so that I could begin focusing more on Mr. Stick as a character for my new writer's notebook, rather than my traditional journal. The new materials have been posted on my writer's notebook resource page here at my website. Please be sure to check them out; my illustrated writer's notebook is one of the best teaching tools I have ever created to share with my students. Below, I happily share some of the most popular artifacts from my now-retired "Cave Wall Journal" presentation. Mr. Stick was featured in the NNWP's 2005 Writing Across the Curriculum Guide. This seven-page article--"Both Art and Writing Must Be Non-Intimidating"-- is what I wrote for that publication's "Journals & Learning Log Section." Here's the original PowerPoint Drawing Lesson I created (complete with the original sound effects, which I NEVER use in my PPTs anymore! ); this showed my students how to draw Mr. Stick step-by-step. So many people asked me to e-mail them this one-slide demonstration, that I finally put it here on-line. Because I wanted it to keep its animation, I didn't post it as a PDF. If you modify this, please be sure to cite me as the original author. I appreciate it. My students learned to draw Mr. Stick using specific criteria in the first two weeks of school. This two-page document was a part of their notebooks, and we referred to it if a student suddenly forgot how to correctly draw our community"margin mascot. " If anyone knows the original creator of this fabulous face handout, please tell me! It was shared with me over e-mail long ago with the instructions "distribute freely," which I have always done. This handout will make your Mr. Stick creations come to life as well as teach emotional vocabulary. Mr. Stick, from his spot in their journal margins, needed to say things about what the students had written. When my students needed assistance giving Mr. Stick more intelligent things to say, I gave them one of these Mr. Stick Bloom's dice, which were folded and taped before being rolled. Click the image to be taken to WritingFix, where I have provided a write-up of this journal page assignment. The goal of my original writer's workshop was fairly simple: students were to write enough in their journals so that on designated workshop days, they could flip through their pages to find and self-select an idea they would be willing to take through the entire writing process. When a piece went through all steps of the writing process, it would go into that student's writing portfolio. In my classroom, I expected students to go through this process ten times in a school year. 80% of my students' final grades were based on the pieces of writing in their portfolios. Writer's workshop was the most important work we did in class. Their writing ideas always began in their journals. At right are some artifacts from my mythology classes' writer's workshop. Here are two journal pages from two students, and the portfolio pieces they ultimately inspired. Geography teacher Jenn Wright shared with me this seven-page instruction manual that she uses to teacher her students to draw her Mr. Stick variation. Math teacher Holly Young had her students use Mr. Stick to help them process notes. Here, she required a "Mr. Stick Soap Opera Story Board" to teach radical numbers. Math teacher Holly Young also shared with me this page from a different student's math notebook. Here, students processed perpendicular and parallel line notes. My students loved Mr. Stick so much in their journals that they began asking if they could use him with their outside-of-journal assignments too. Of course, I said yes. As I continued learning about better formative assessment techniques and differentiating formative assessments, I began to create Mr. Stick examples for my other classroom strategies. Mr. Stick's Vocabulary Sketch-n-Write has students define several related vocabulary terms in their own words on the right, then illustrate on the left with stickman-art. Mr. Stick's Haiku Comic Strip has students summarize information from their notes in a haiku-inspired storyboard. I hope you've enjoyed these Mr. Stick materials. If you wish to use them in your classroom or share them with teachers, you have my permission provided you keep any page citations intact. Thank you.